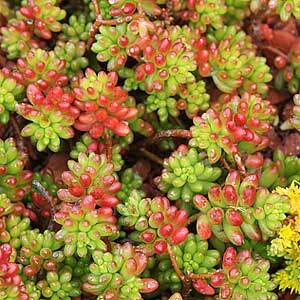 Commonly called the Jelly Bean Plant, Sedum rubrotinctum is a small succulent with very attractive foliage. The foliage does look like Jelly Beans, and the colour will depend on the variety, as well as the amount of sun the plants gets. This is a very easy care succulent is actually a hybrid, and is a very low growing type. Generally the foliage is green through winter, as the weather warms, and the plant receives more sun, the rounded bean like leaves change to a brilliant red on the tips, and yes it will flower in autumn. The flowers are small but a bright yellow. As winter comes around those red leaves will turn back to green. This is a very easy care plant, we do suggest a specialist cactus and succulent potting mix, or add some perlite to normal potting mix to ensure good drainage. Position – Best in full sun for colour, although it will grow in part shade. Height – Will reach around 20 cm in height. Spread – Will reach a width of around 35 cm over time. Sometimes more. Fertiliser – A little liquid fertiliser once a year is usually adequate. They the Jelly bean plant in a rock garden, use it as a ground cover plant as it only reaches a few centimetres in height. Try growinf it in a hanging basket allowing it to trail over the edge. Use it for underplanting taller growing succulents. A few different varieties are available, generally to do with the intensity of the colour of the foliage in summer. 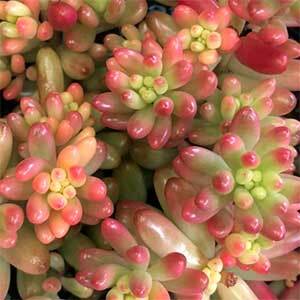 Sedum Rubrotinctum Aurora is commonly called ‘Pink Jelly Beans’ and the leaves do tend more towards pink than red. The easiest method of propagation is from leaf cuttings which will strike very easily.